There are a few places on this map where things aren't quite right, but I'll leave those in as copy protection. 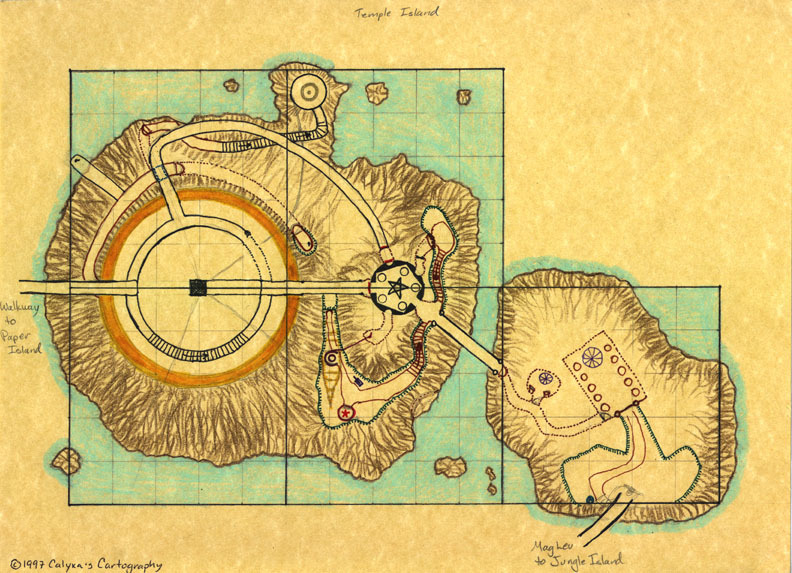 It was interesting to discover that Temple Island is really two islands, you can tell when you look at the map imager machine on CD 4. Red star is where you start the game. Yellow circle is the big gold dome. Smaller black circle with the black star in it is the rotating room. If you've missed it or want to see it again, I have a detailed map of the rotating room. Telescope is in dark red, a circle inside of a C-shaped semi-circle. Iron plates covering the fissure outlined in pale brown. Elevator platform shown in dashed blue. Purple segmented circles are the cage holographic machines, the smaller one is the transmitter, the larger is the receiver.